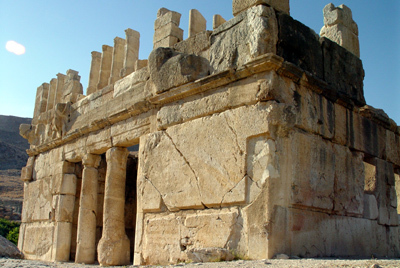 The palace that today is called “Qasr al–Abd” (the castle of the servant) was the major building on the Tobiad estate. It was build by Hyrcanus about 180 B.C. although it was not yet complete at the time of his death in 175 B.C. It seems that it may never had been finished. For a very helpful description of this palace see: Netzer, Ehud. "Tyros, the 'Floating Palace'." Pp. 340–53 in Text and Artifact in the Religions of Mediterranean Antiquity, ed. by Stephen G. Wilson and Michel Desjardins. Toronto: Canadian Corporation for Studies in Religion, 2000.